or Thursday August 30 @ 6pm at the Lemon Grove Library Community Room. Dustin Burns, Lead Outdoor Education Specialist from the San Diego County Office of Education, will share a presentation as well as answer your questions about Outdoor School, a once in a lifetime experience for Lemon Grove 6th graders! The memorable week includes a variety of hands-on science experiences in beautiful the Rancho Cuyamaca State Park. Students gain an appreciation of nature, develop an understanding of how life functions on earth, learn the importance of reducing human impact on the environment, and practice how to think like a scientist. Students participate in countless activities throughout the week, including nature studies, all-day adventure, geocaching, rock climbing, archery, crafts, team-building, night hike, campfire, astronomy, and talent show. Please ﻿click here for the Parents and Donors payment portal to make a camp donation through our partner Mission Federal Credit Union. This year’s recommended donation is $125.00. If you are unable to contribute the full amount, please notify your child’s Principal. 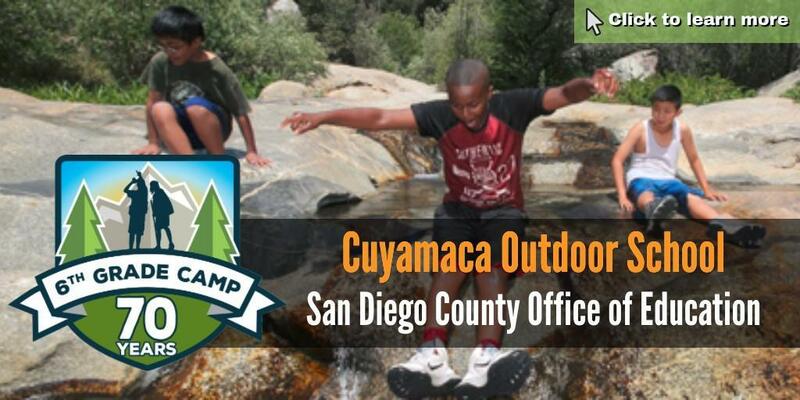 To learn more about the SDCOE’s Outdoor Education program, click here.